Only recently have I read Oscar Wilde's long epistle written between January and March 1897 during his incarceration in Reading Gaol not long before his final release. It was written to Lord Alfred Douglas who apparently tore it up after only reading the first few pages, perhaps naively believing it was the only existing copy. It was written on 20 sheets of paper, which printed in book form come to about 84 pages. Previously I had been reluctant to read it, suspecting that it would be a long, drawn-out, vindictive soliloquy of irony and bitter pathos, on his being the victim of cruel injustice. In fact it is in many ways a moving prose poem, written more likely for the writer than for the addressee. It is also a voyage of reconciliation, though in some ways paradoxical, as it would have to be, in view of the nature of its author. It could also be likened to 'a return', the underlying theme of certain works of Hermann Hesse. Every detail regarding the fatal three years of acquaintance with Alfred Douglas is deeply engraved in Wilde's memory, and from the depths of suffering and loneliness, it is fully, meticulously expressed, or purged onto prison paper in just as profound a way. 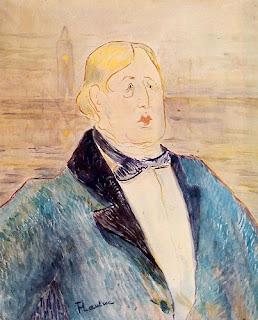 It begins by Wilde's referring to how he has been callously used, exploited, made bankrupt, totally ruined in reputation and vocation, even losing the paternal rights to his sons as a fatal consequence of his own weakness in complying to the incessant demands of a spoilt parasite. Even Alfred Douglas's mother was an accomplice to Wilde's downfall because of her own weakness and irresponsibility regarding her Machiavellian son. It was indeed a tragic period consisting of a fatal chain of events during which Wilde tried several times to free himself from the leech-like grip Alfred Douglas incessantly held on him. Wilde's own faith, affection and vanity may have prevented him from considering the likelihood that Alfred Douglas was totally jealous of Wilde's incontestable talent, success, fame and fortune. And Alfred Douglas's father, John Douglas, the Marquis of Queensberry, was probably just as jealous of his son's close relationship with Wilde. Together, each one in his own despicable way, even though they equally hated each other, plus the complicity of Alfred's weak mother, was more than enough to irrevocably bring about Oscar Wilde's infernal, abysmal and ruinous descent. Naturally his timeless work lives on for the pleasure of so many. Only the infamy, hate and pettiness of his persecutors will continue to have a contemptable pittance of historical relevance. One of the most delightful dinners I remember ever having had is one Robbie and I had together in a little Soho café, which cost about as many shillings as my dinners to you used to cost pounds. Three months later still, in September, new scenes occurred, the occasion of them being my pointing out to you the schoolboy faults of your attempted translation of Salome. You must by this time be a fair enough French scholar to know that the translation was as unworthy of you, as an ordinary Oxonian, as it was of the work it sought to render. You did not of course know it then, and in one of the violent letters you wrote to me on the point you said that you were under 'no intellectual obligation of any kind' to me. I remember that when I read that statement, I felt that it was the one really true thing you had written to me in the whole course of our friendship. The night we arrive (Grand Hotel, Brighton. nda) you fall ill with that dreadful low fever that is foolishly called influenza, your second, if not third attack. I need not remind you how I waited on you, and tended you, not merely with every luxury of fruit, flowers, presents, books and the like that money can procure, but with that affection, tenderness and love that, whatever you may think, is not to be procured for money. (...) I got special grapes from London for you, as you did not care for those the hotel supplied, invented things to please you, remained either with you or in the room next to yours, sat with you every evening to quiet or amuse you. After four or five days you recover, and I take lodgings in order to try to finish my play. You, of course accompany me. The morning after the day on which we were installed, I feel extremely ill. You have to go to London on business, but promise to return in the afternoon. In London you meet a friend, and do not come back to Brighton till late the next day, by which time I am in a terrible fever, and the doctor finds I have caught the influenza from you. Nothing could have been more uncomfortable for anyone ill than the lodgings turn out to be. My sitting-room is on the first floor, my bedroom on the third. There is no manservant to wait on one, not even anyone to send out on a message, or to get what the doctor orders. But you are there. I feel no alarm. The next two days you leave me entirely alone without care, without attendance, without anything. It was not a question of grapes, flowers, and charming gifts: it was a question of mere necessities: I could not even get the milk the doctor had ordered for me: lemonade was pronounced an impossibility: and when I begged you to procure me a book at the bookseller's, or if they had not got whatever I had fixed on to choose something else, you never even take the trouble to go there. And when I was left all day without anything to read in consequence, you calmly tell me that you bought me the book that they promised to send it down, a statement which I found out by chance afterwards to have been entirely untrue from beginning to end. All the while you are of course living at my expense, driving about, dining at the Grand Hotel, and indeed only appearing in my room for money. You concluded your letter by saying; 'When you are not on your pedestal you are not interesting. The next time you are ill I will go away at once.' Ah! what coarseness of fibre does that reveal! What an entire lack of imagination! How callous, how common had the temperament by that time become! But you, like myself, have a terrible tragedy in your life, though one of an entirely opposite character to mine. (...) In you Hate was always stronger than Love. (During Wilde's two year prison term, he never received any word from Douglas, but he learns from a friend that Alfred wants to publish some of Wilde's private letters to him with an article for Le Mercure de France. Wilde, naturally shocked, refuses him such permission. Later Alfred Douglas has a volume of his poems published and dedicates them to Oscar Wilde, naturally without Wild's permission, no doubt to make up for Wilde's refusal to permit the publication of his private letters. Notwithstanding having ruined Oscar Wilde, causing his incarceration, and also obliging him to cede all copyright of his works to his creditors, Alfred Douglas, totally unperturbed and without the slightest scruple, still continues to try to commercially exploit Oscar Wilde in order to try to compensate for his own sad and insignificant mediocrity). When I was brought down from my prison to the Court of Bankruptcy between two policemen, Robbie waited in the long dreary corridor, that before the whole crowd, whom an action so sweet and simple hushed into silence, he might gravely raise his hat to me, as handcuffed and with bowed head I pass him by. Men have gone to heaven for smaller things than that. It was in this spirit, and with this mode of love that the saints knelt down to wash the feet of the poor, or stooped to kiss the leper on the cheek. I have never said one single word to him about what he did. I do not know to the present moment whether he is aware that I was even conscious of his action. It is not a thing for which one can render formal thanks in formal words. I store it in the treasure-house of my heart. I saw Robbie for an hour on Saturday week, and I tried to give the fullest possible impression to the delight I really felt at our meeting. And that, in the views and ideas I am here shaping for myself, I am quite right is shown by me by the fact that now for the first time since my imprisonment I have a real desire to live. There are times when Sorrow seems to me to be the only truth. Other things may be illusions of the eye or the appetite, made to blind the one and cloy the other, but out of Sorrow have worlds been built, and at the birth of a child or a star there is pain. Christ's place indeed is with the poets. His whole conception of Humanity sprang right out of the imagination and can only be realised by it. What God was to the Pantheist, man was to him. He was the first to conceive the divided race as a unity. Before his time there had been gods and men. He alone saw that on the hills of life there were but God and Man, and, feeling through the mysticism of sympathy that in himself each had been made incarnate, he calls himself the Son of the One or the son of the other, according to his mood. More than anyone else in history he wakes in us that temper of wonder to which Romance always appeals. There is still something to me almost incredible in the idea of a young Galilean peasant imagining that he could bear on his own shoulders the burden of the entire world : all that had been already done and suffered, and all that was yet to be done and suffered: the sins of Nero, of Cæsar Borgia, of Alexander VI., and of him who was Emperor of Rome and Priest of the Sun. I have said of Him that he ranks with the poets. That is true. Shelley and Sophocles are of his company. But his entire life also is the most wonderful of poems. For "pity and terror" there is nothing in the entire cycle of Greek Tragedy to touch it. And, above all, Christ is the most supreme of Individualists. Humility, like the artistic acceptance of all experiences, is merely a mode of manifestation. It is man's soul that Christ is always looking for. He calls it "God's Kingdom" (βασιλεία τοῦ θεοῦ) and finds it in everyone. And as for Altruism, who knew better than He that it is vocation not volition that determines us, and that one cannot gather grapes off thorns or figs from thistles? To live for others as a definite self-conscious aim was not his creed. It was not the basis of his creed. When he says "Forgive your enemies," it is not for the sake of the enemy but for one's own sake that he says so, because Love is more beautiful than Hate. In his entreaty to the young man whom he looked on he loved, "Sell all that thou hast and give it to the poor," it is not of the state of the poor that he is thinking but of the soul of the young man, the lovely soul that wealth was marring. (Oscar Wilde continues to reveal his religious views in such a way that one would have loved to have such an open, wise and imaginative teacher of theology, or even a 'Wilde' man of God reasoning thus to us from a church pulpit. For his particular religious views alone, Di Profundis is precious). Some six weeks ago I was allowed by the Doctor to have white bread to eat instead of the course black or brown bread of ordinary prison fare.. It is a great delicacy. To you it will sound strange that dry bread could possibly be a delicacy to anyone. I assure you that to me it is so much so that at the close of each meal I carefully eat whatever crumbs may be left on my tin plate, or have fallen on the rough towel that one uses as a cloth so as not to soil one's table : and do so not from hunger - I get now quite sufficient food - but simply in order that nothing should be wasted of what is given to me. So one should look on love. Like all poetical natures, He loved ignorant people. He knew that in the soul of one who is ignorant there is always room for a great idea. But he could not stand stupid people, especially those who are made stupid by education - people who are full of opinions not one of which they can understand, a particular modern type, and one who has the key of knowledge, can't use it himself, and won't allow other people to use it, though it may be made to open the gate of God's Kingdom. His chief war was against the Philistines. Of course the sinner must repent. But why? Simply because otherwise he would be unable to realise what he had done. The moment of repentance is the moment of initiation. More than that. It is the means by which one alters one's past. The Greeks thought that impossible. They often say in their gnomic aphorisms "Even the Gods cannot alter the past." Christ showed that the commonest sinner could do it. That it was the one thing he could do. Christ, had he been asked, would have said - I feel quite certain about it - that the moment the prodigal son fell on his knees and wept he really made his having wasted his substance with harlots, and then kept swine and hungered for the husks they ate, beautiful and holy incidents in his life. It is difficult for most people to grasp the idea. I dare say one has to go to prison to understand it. If so, it may be worth while going to prison. (After several more enlightening pages on Christ, Wilde then gradually, subtly returns to the addressee of this famous letter, alluding once more to Douglas's attempt at trying to publish Wilde's private letters in Le Mercure de France). You must remember that a patronising and Philistine letter about "fair play" for a "man who is down" is all right for an English newspaper. It carries on the old traditions of English journalism in regard to their attitude towards artists. But in France such a tone would have exposed me to ridicule and you to contempt. I could not have allowed any article till I had known its aim, temper, mode of approach and the like. In art good intentions are not of the smallest value. All bad art is the result of good intentions. Curiously he ends his long, instructive and very moving letter with a strange confidence that he will be meeting Alfred Douglas in the future in order that they have the opportunity 'to know each other'). To have thus ended what is considered a remarkable poetic epistle, incredibly Oscar Wilde must, even then, have still been irremediably infatuated by Douglas. Or did he simply wish to have a final opportunity to pardon him? Perhaps both. In fact they did meet again, at Rouen, France, despite the strong disapproval expressed by their respective families and friends. Under the circumstances perhaps their reunion was nevertheless to their reciprocal, 'spiritual credit'. Towards the end of 1897 they lived for some months in Naples. The reunion however was short-lived due to the threat of their no longer being granted financial means from Constance Wilde in Oscar's case, and from Queensberry in Alfred's case, had they persisted. Perhaps it was just as well that they took heed of this threat and finally parted company. Three years later, one month before the end of the century, Wilde died on the 30th November, of meningitis. He was first buried in Le Cimetière de Bagneux. Nine years later his remains were disinhumed to be reburied in Le Père Lachaise Cimetière in Paris. His tomb, somewhat pathetically damaged and now covered in graffiti, was designed by Sir Jacob Epstein, but Wilde never needed it in any case. As a final note, none of the sculptures pretending to portray Oscar Wilde neither do him, nor the respective sculptors responsible, any credit whatsoever. On the contrary. Phony, shameful books professing to be partly his work have also been published. One also wonders if there are any noteworthy films on Oscar Wilde, made without too much accent on the fatal period of his 'more personal, negative pursuits'. Certainly films have been made, but they can hardly have been memorable productions, otherwise one would never have wondered. After reading Di Profundis, however, the details are so vivid that the reader is transported into the epoch, into the plush hotel suites, the restaurants, rented lodgings, and into the very prison cell where Wilde wrote his long missive. It occurred to me that Di Profundis itself, so rich in visual, historic information and spiritual insight, could in itself contribute to make a very noteworthy film indeed, provided it is made by the right producer. There are such sincere film producers, who are also poets, endowed with souls. (Amongst others, Steven Spielberg is certainly a good example).